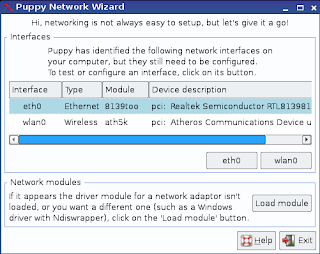 It has been a while since I had a look at Puppy Linux (www.puppylinux.org). so I thought I’d have another go to see how much it has improved over the past few years. This post is about Wary. There will be follow up posts about Lupu and Slacko shortly. I burned the Wary image to a cd and rebooted my PC. 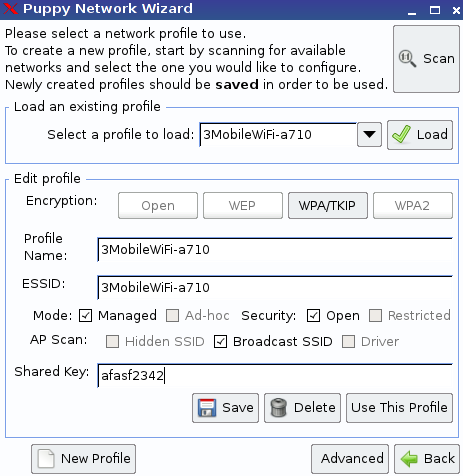 On the first boot of Puppy you are asked a series of questions such as your location and timezone. You are then asked which display drivers to run out of Xorg or Xvesa. The recommendation is to use Xorg and only use XVesa as a fall back option. The laptop I am using (Samsung R20) is not that old so XOrg worked perfectly fine and instantly found the best resolution. Finally after a few minutes I am taken to the default start screen. The Puppy desktop is icon heavy. This is not something I normally like. I’m more of a minimalist. I like my desktop to be a nice picture with very little else on it. There are five rows of icons. The first row of icons are all system icons such as File (graphical directory browser), help, mount, install (package management), setup, edit and console. The second row has office style icons such as write, calc, paint and draw. The third row has connectivity icons such as browse, email and chat. The fourth row has a calendar icon and video player icon. The fifth row has one icon called connect which is used to set up network settings. In the bottom left corner there are icons for each of your drives. On the right hand side there are icons for locking the screen, file compression and trash. Finally at the very bottom of the screen there is a menu bar including a menu, icons for virtual panels and a system tray with battery monitor, clock, network setting and volume. I don’t know about you but the first thing I try when I load a new distro is to try to connect to the internet. The way to do this is to click the connect icon but the actual setting up of the internet was not as intuitive as I would have hoped. 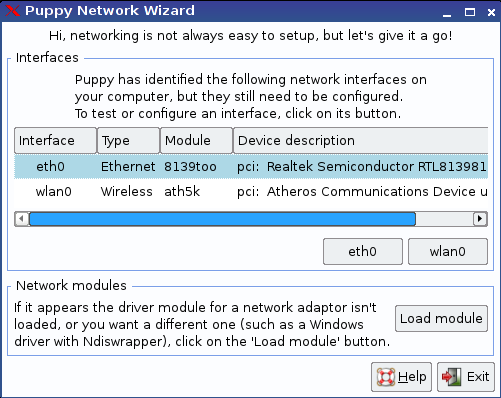 From the image above you can see it shows eth0 and wlan0. For a newbie it is not obvious which one to select. What I would say though is that the help function is quite good. 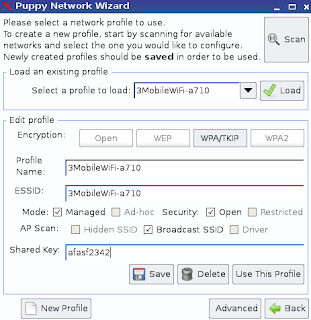 In this case I was trying to set up my three mobile broadband so I selected wlan0. 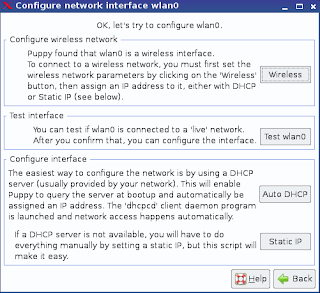 Ok so a new screen is displayed with options to configure a wireless network, test the interface and configure the interface. The screen is in a logical order of steps you need to follow so the first thing to do was to click the wireless button. Finally we are at the screen where you can set up the wireless connection. (Think of it this way. When you run a Ubuntu based distro you usually click the little wireless symbol and it shows a list of wireless connections, on an xbox it shows you the wireless connections, even on the WII it shows a list of wireless connections. In puppy we are three screens deep before we are even close). Clicking the scan button finally pulls back a list of available networks. Click the one you want to connect to. Choose the encryption method and enter the shared key. At this point it is a good idea to click Save. Finally click use this profile. After a little bit of checking if everything has gone well you will be told the connection was successful. At this point you are still not connected to the internet. 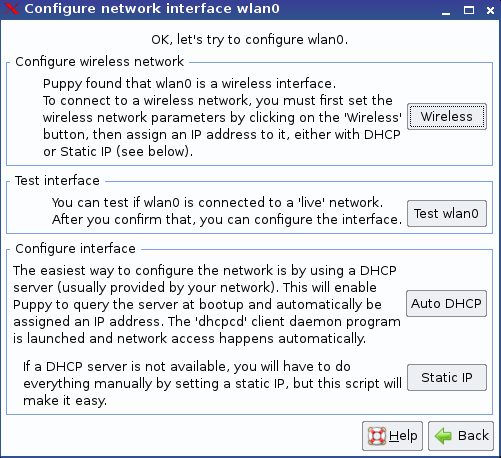 From the configure network interface screen you should now click the auto dhcp button. This will connect you to the internet. A good thing now happens. A message appears asking if you want to install the Adobe Flash driver. I clicked yes and instantly went onto you tube to see if the videos would play. 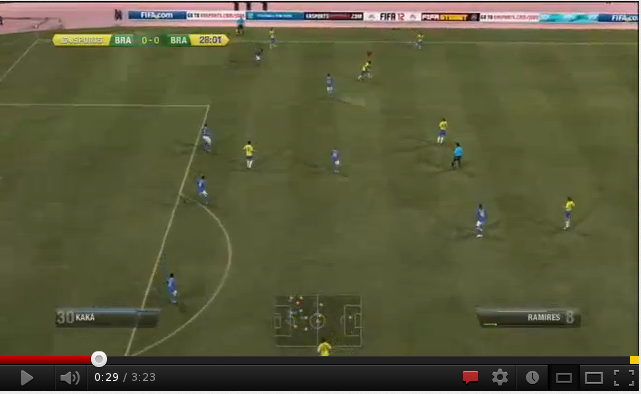 As you can see from the above screenshot the video played perfectly well. 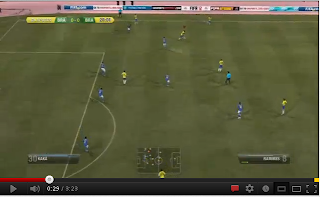 (I watched the top 5 fifa 12 goals of the week). At this point it is worth noting that you should probably consider rebooting. The reason for this is that it enables you to create a save file on your hard drive or a pen drive. This will basically provide you a way to install new software and store any files you create. You will be asked a series of questions such as where the file will be stored and how big do you want it to be. When you reboot it takes a fair while to actually start up but a helpful message appears telling you that this is a one off and next time it won’t take so long. To test this theory out I rebooted again. Whilst it didn’t take so long it still took quite a while. The reason for this is that puppy loads itself completely into memory. Whilst this has an effect on initial boot time it does free up your cd drive and all the applications load and run incredibly quickly. What about the software that you get with Puppy? Ok so don’t expect LibreOffice, Rhythmbox or Gimp. There are however loads of applications installed by default including image editors, video players, CD/DVD creation, lots of system utilities, screenshot capture tools, irc chat, a basic spreadsheet package, project management package and personal finance manager. To be honest there are too many tools to mention. If you can’t find the program you want there is always the ability to install other applications. To install packages click the install icon. At this point you can choose to install puppy to your hard disk but the recommendation by the puppy people is that puppy isn’t designed to run from the hard disk. 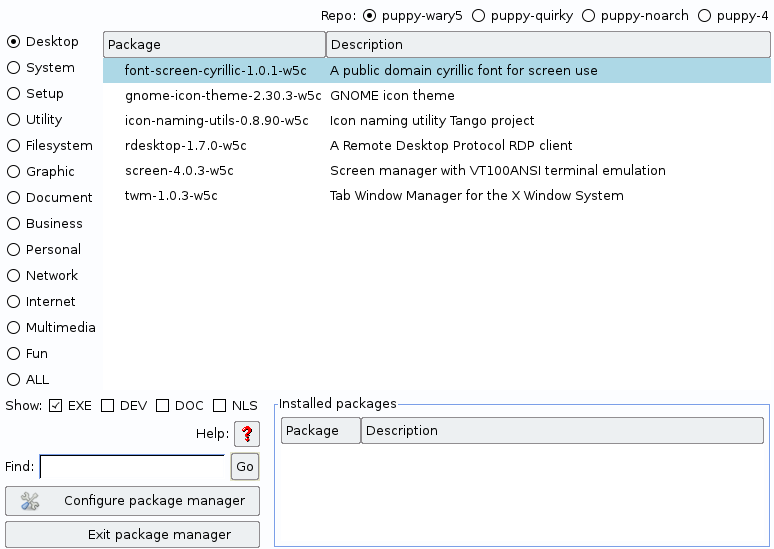 In the bottom half of the wizard there is a button to run the puppy package manager. Puppy uses packages called PETs and there is a huge selection to choose from. If you want GIMP you can get GIMP, if you want VLC you can get VLC. Now it has to be noted that most of the packages are very light packages and that keeps with the whole Puppy ethos. 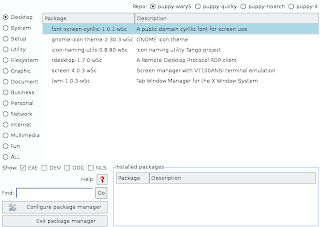 If you want an all singing all dancing distro that has the most resource intensive packages with all the features then puppy is not for you. So where does puppy fit in? Well it would run well on most netbooks that is for sure and it is great if you want to do a bit of web surfing and want to get online quickly. The host of system tools makes it perfect for burning DVDs or creating screenshots. I don’t think it is a distro that I would use for my main distro and I’m not sure I would recommend anyone else to do so. The thing is that it is ultra light so if you really want quick light tools then it is great but on your main computer, the one you paid a lot of money for that is capable of so much more why not have that extra bit of bloat with the bells and whistles and the snazzier packages. I think the only fair thing to do now is to compare Puppy to other similar lightweight distros. Lets start with Lubuntu. Lubuntu has the advantage that it is backed up with Ubuntu’s huge resources in terms of package management and it is so much easier to get online. 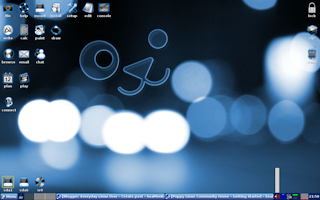 However how light is Lubuntu really? Take the LXDE away and it is every bit as heavy as Ubuntu. It is like having a bit of chocolate cake but removing the top layer of icing. I don’t consider Lubuntu to be truly that light. What about Bodhi? Bodhi is great. I have installed on my netbook full time. I like the boot speed time which leaves both Puppy and Lubuntu for dust. The selection of packages is good and there is a great repository. Would I replace Bodhi with Puppy? Probably not. Do I like Puppy? Well it is ok. I like the selection of tools and now I have connectivity it works well enough. I’ve not had any issues but there isn’t much to have issues with. For those who have reached this far, thanks for reading. I will be posting about the other puppy versions soon. Since you like Bodhi, you might want to also try Macpup, which is Lucid Puppy with the Enlightenment E17 desktop. The look and feel is much better than the main Puppies. I found some comments about Puppy Linux running everything in root by default. Is that secure? How might one mitigate against this? I don't know what you consider to be a "slow" boot, but I am running a frugal install of Wary 5.1.4.1 on what was originally a Windows 98 laptop: 333 Mhz Pentium II with 192M ram and 2G of hard disk. Puppy Linux fully boots in under 45 seconds and completely shuts down in less in 10 seconds. If you install Puppy and alter the config file so that the boot/splash screen is only a a few seconds it will boot in no time. Even just installing to a flash drive it can boot very quickly.